Real estate follow-up is not a sprint, it is a marathon. Learning how to get seller leads is great, but if you don’t follow up with them, you aren’t going to close many at all. I know this from experience. I used to do a great job generating leads for myself. In fact, I had so many that if they didn”t answer their phone or respond to the first email, I would ignore them. That was 300 potential transactions that I let slip down the drain. That was 300 potential relationships that I could have built. At an average price point of $250,000 that was $2,250,000 (Yes, $2.25 million) in potential commission income. All because I didn’t think it was necessary to follow up on people who were “unmotivated.” Yeah, I feel like an idiot. Apparently, I am not alone in being an idiot though when it comes to real estate lead follow up. Roughly 44% of sales people give up after one “no.” Another 22% give up after two. 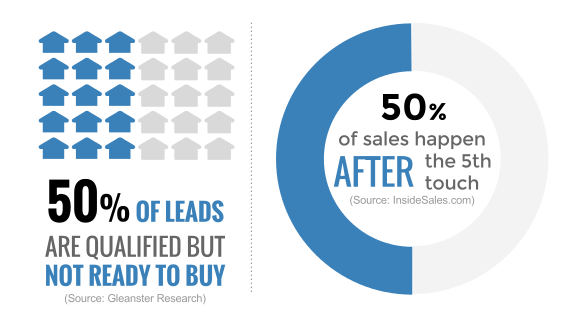 This means that 66% or two-thirds of agents will never follow up a third time. Yet according to several studies, 80% of “non-routine” purchases like a home are made after at least 5 follow ups. Another startling statistic is that 63% of people who contact you today won’t buy for at least 3 months. If you are not following up with your real estate leads more than once, you are missing out on a ton of business. Everyone is familiar with the idea of tracking their close rate, but what about your contact rate and meeting rates? Most companies are only focused on closing hot leads. At first glance this seems to make sense. Focus on your best opportunities, right? The problem with this approach is that it leaves a lot of good leads, that just need more time and nurturing, to wither on the vine. 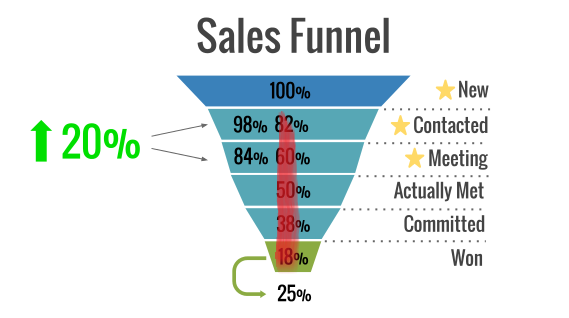 Most companies simply don’t realize how many leads are won or lost at the top of the funnel. By specifically focusing on improving your contact rate and your meeting rate, you can easily increase the yield of opportunities from your existing lead flow. For example, if we improved the contact and meeting rate in the sales funnel above here’s what would happen. 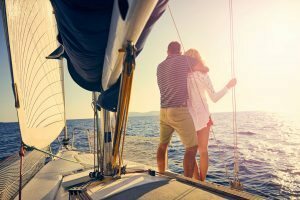 That upstream improvement of 20% in contact and meeting rates netted out an 40% increase in overall close rate which translates directly to bottom line revenue. Is an 40% percent improvement in bottom line sales revenue worth the effort? Absolutely. 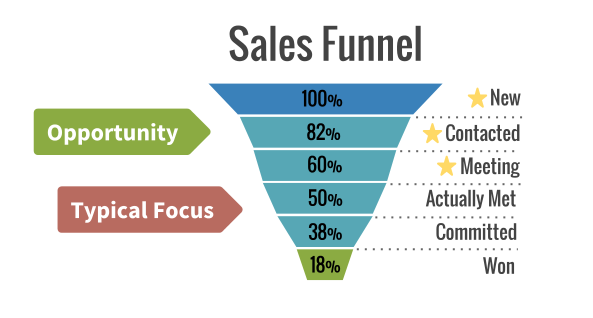 Focus on optimizing the initial stages of the sales funnel as much as the latter stages. People don’t always pick up on the first try and sometimes it takes multiple calls to make contact. The question is, are you a salesperson or an order taker? Order takers send documents, accept contracts and don’t concern themselves with anything upstream from those tasks. Sales people work to make contact, then deal with objections, and finally match problems with solutions to help prospect discover value in their service. Some agents may genuinely feel that repeated follow up attempts will only annoy the prospect, but we find this rarely to be the case as long as no more than 6 calls attempts are made over a period of several weeks. Very few companies meet or exceed this threshold. So how many calls should you make before giving up? Below is a contact probability arc created using sales data on persistence. 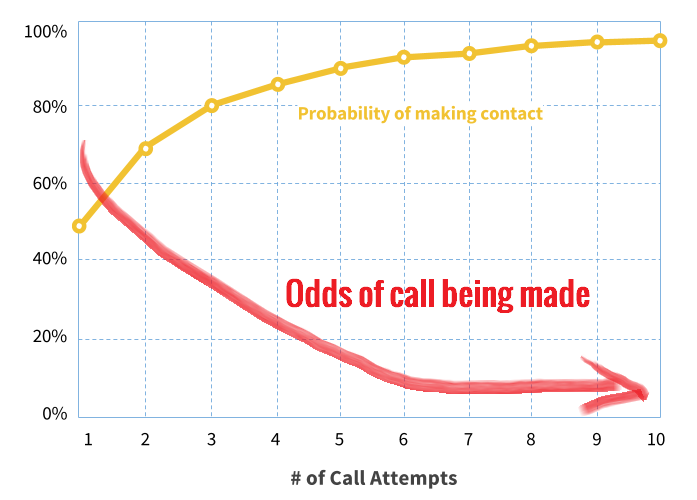 It shows the correlation between making another call and the probability of making contact. 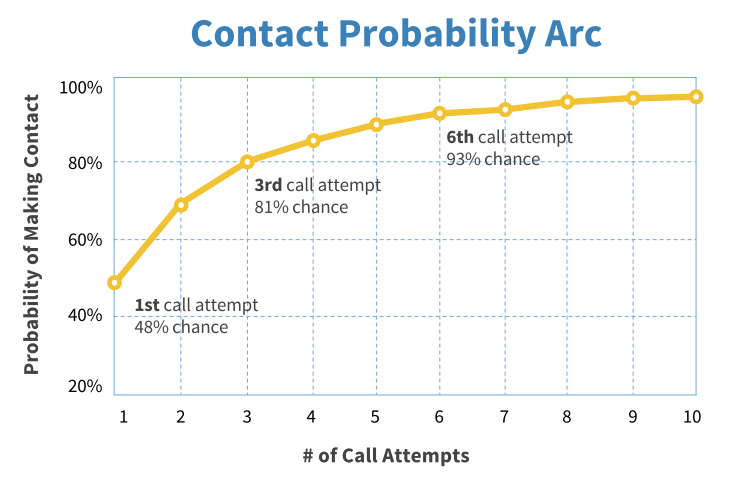 This same research also reveals that leads contacted after the the 6th call are 45% less likely to to convert than leads contacted prior to that point. The good news is that as the odds of making contact go up with each additional call, the odds of agents actually making another call are also going down. The field is most crowded at the outset but then thins considerably leaving a very wide opportunity for the companies that are persistent. Be persistent in your follow up. Tenacity pays huge dividends. Not all leads are ready to buy right out of the gate, but that doesn’t mean they aren’t worth pursuing. If real estate is about location, location, location, lead nurturing is about follow up, follow up, follow up. The goal is to stay in front of prospects in a way that creates value rather than annoyance. It’s part art part science. A good lead nurturing efforts match the buying timeline of every prospect, whether that be a week, a month or a year. The pace and tenor of follow up may change over time, but it should never just stop because the prospect wasn’t ready to buy immediately. The companies that master this are able to build a long term asset out of their leads rather than running a churn and burn operation that wastes good leads. Learning to nurture long term leads will radically increase the yield on your existing lead flow. Don’t leave follow up to chance. Most brokers fail to invest in setting and communicating clear expectations for what good follow up actually looks like beyond some vague generalities. Get specific. Create a follow up schedule that outlines when calls and email follow ups should be happening. Your team will appreciate that you take it seriously respond better with clear expectations. The goal is to maintain appropriate, timely follow up no matter if they’re ready to sign a contract today or ask you to call them back in two months. Starting out, two basic contact schedules should suffice, one for active leads and another for passive leads. Passive leads are still qualified but are on a longer term buying timeframe. Follow up schedules can and should extend all the way out to 12 months, although the tenor and frequency of communications should change significantly as time goes on and based on the level of interest displayed from the prospect. Mapping out your follow up schedule means no leads fall through the cracks. It’s as simple as it sounds. Use more than one way reach out. Email, snail mail, phone, text, social, it’s all on the table. The goal is to touch prospects in different ways in order to stay top of mind and stand out from the competition. Get ahold of people whatever way works. Think outside the box. In business, as in life, timing is everything. Some days of the week and times of the day are simply better for making sure you connect with prospects. The following two charts are an overlay of email open rates from MailChimp and phone contact rates from first dials from an MIT study. 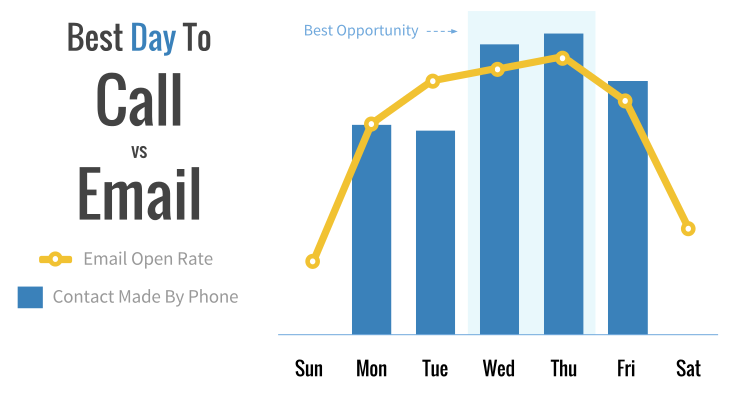 Thursday is 26% better for email open rates than the worst weekday, Monday. 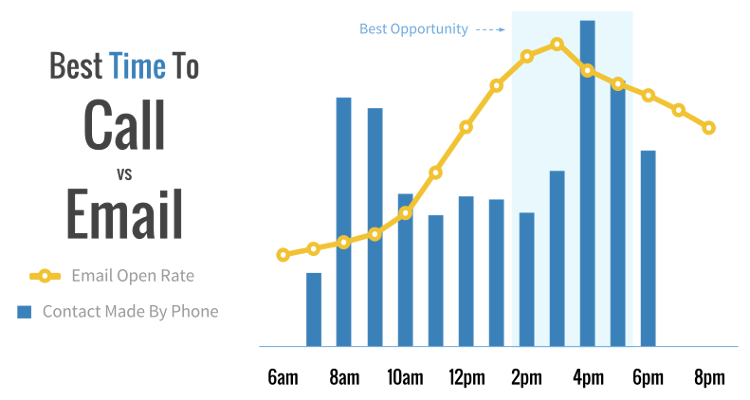 Thursday is 49% better for phone contact rates than the worst weekday, Tuesday. Not all days of the week, or times of day are created equal. Try to time your follow up so that you hit the sweet spot where you have the highest odds of getting a response. Question: How can you make it ridiculously easy to send the right follow up message, at the right time, every time? Answer: By lowering the bar for effort and creativity with pre-baked email templates. Email templates are one of the most powerful weapons in your sales tool box. If you do nothing else in this list, do this. The point here is that you’re increasing the bar for quality and consistency of the emails being sent to prospects, while simultaneously lowering the bar for effort and creativity enough that agents have no excuse not to send out timely, well written follow up emails. Note that the goal here is to ASSIST agents in the sales process, not REPLACE their work load. It is still critical for agents to actively manage their leads and personalize these emails so they don’t come across as canned. Unlike drip emails which can foster an out of sight, out of mind attitude, email templates provide convenience while still requiring the sales person to engage with the prospect and their specific needs. Why anyone would leave something this important up to chance, or want to recreate the same emails from scratch over and over again is beyond me. Email templates can be one of your most effective tools. Equip yourself and your agents with well crafted emails that are battle tested and proven to be effective at moving prospects toward the sales. So let’s say you put a great system in place, then the question becomes – is anybody using it? Are leads actually being called? Are any leads going stale? These are critical questions, but who’s got the time to go back and take notes documenting every call and email? The original contact information for each lead is preserved, an alternative set of tracked contact info is also generated for each lead. When you make outbound calls and emails this way, the prospect sees them as coming directly from the phone or email address you’re contacting them from (although some systems allow you to dictate a custom Caller ID). This way, all calls and emails are stored for each prospect and can be reviewed as needed. Having this information is invaluable for managing sales and is a basic prerequisite for observing what’s really going on in your sales process. There’s no substitute for real data about sales activities. Automatically tracking calls and emails is incredibly easy and there’s simply no excuse not to track those activities. If someone genuinely wants you to stop contacting them you should. Period. But you can often avoid getting to that point by establishing good rapport and clear expectations. If you end each conversation, regardless of how motivated the prospect is, by asking for permission to follow up with them in a certain period of time, you’re always going to be operating in the realm of mutual respect and consideration when you follow up. For example if you’ve got a great prospect who won’t be ready to rent it for another 6 months, it only makes sense to end the call with, “Joe, do you mind if I call you back in 4 months to check in and see how things are moving along?”. If they say no, then you know where you stand. If they say yes, then you’ve got an open door and clear expectation that you will be following up. By asking for permission to follow up you lower your odds of being an annoyance and have solid footing in the future. Unfortunately, no matter how well you do it there are only so many times that you can ask “are you ready to buy” before it becomes annoying. This is particularly true when there are multiple other companies asking the same thing. Compelling content can open doors because it allows to maintain contact in a VALUE ADDED way versus a VALUE ASKING way. Good content is a serious investment, but it’s an investment in the bank account of trust with each and every prospect and the more you invest the more you will have to withdraw from. It’s sad how few companies understand this. 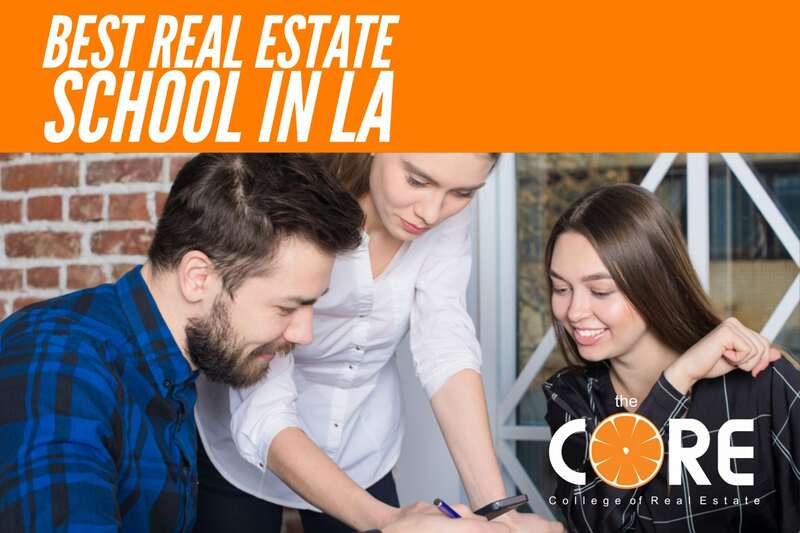 As a property manager, your knowledge about your work is virtually encyclopedic when compared to your average prospect. Smart management companies find ways to leverage that knowledge by creating interesting content that educates and establishes credibility. This could be anything from a well done brochure to an FAQ to featuring a couple of polished testimonials. 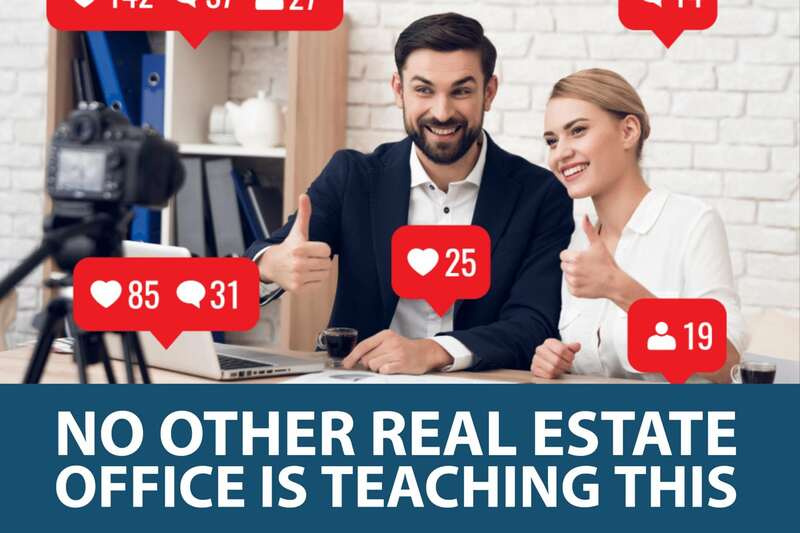 Even a simple video answering basic questions about property management and your services can be a game changer when it comes to building trust and and a personal connection with prospects. We’ll cover content marketing in-depth later, but for now, ask yourself what are three significant topics or questions that you deal with over and over again? How can you answer those questions in a way that is thorough and interesting? Stand out by creating significant value for prospects before asking for the sale. The more you give, the more effective your ask. This is one of my favorite sales hacks; I use it almost daily. Scenario: I’ve have a good initial conversation with a prospect and I know I need to follow up. A follow up reminder is set, but a few days later I notice the prospect is rereading the emails I sent over and I immediately follow up only to have the prospect tell me it was the perfect time because they we’re just thinking about our previous conversation. How is this possible? Email open and clickthrough tracking. There are a couple of services that offer tracking email opens and click throughs including LeadSimple. This technology works by adding a tracking pixel to outbound emails that can record when the email is viewed in your prospects inbox. It’s the same technology that helps retailers like Gap or Target track open rates for mass email campaigns. Tracking email opens and click throughs gives you a huge level of additional insight into which prospects are interested and how they’re interacting with the emails you’ve sent them. Let’s say you want to go back and try to touch base with older leads that were qualified but not yet ready to buy yet? By “batching” this task it becomes easier to schedule regular follow up on a weekly or monthly basis (read more about the power of batching). The problem is that this task can become unwieldy if you have to fish around for all those numbers and punch each one into the phone. A call down list makes it a breeze to view and click to call a group of leads in quick succession. Assign someone on your team to take one hour a week to go top to bottom and follow up with 20 leads using a call down list. 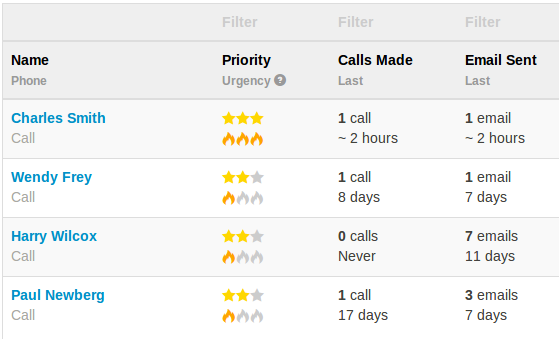 Bonus points for being able to sort and filter the list by things like last contact, # of calls made etc. Call down lists make it incredibly easy to follow up with a large batch of prospects in short period of time. If you’ve gotten this far, you may have been wondering if a conversation about follow up could leave out drip email campaigns. 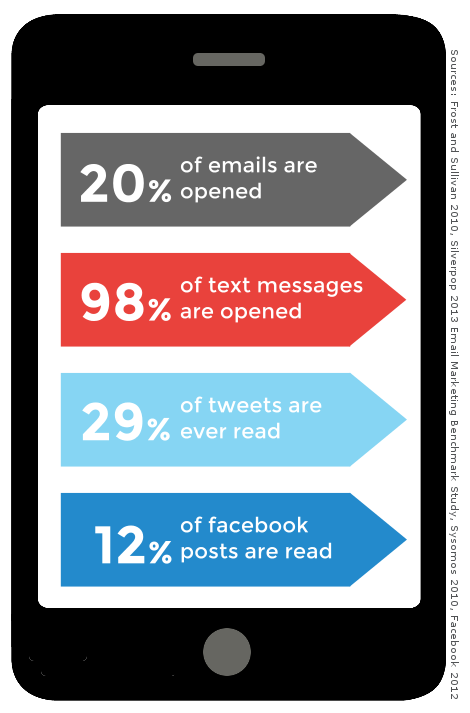 Here’s why drip email comes last on this list. Drip email campaigns are great, but they are an advanced tool that take a lot of effort to generate GOOD content for and execute in a non spammy way. It’s not something to start with but rather to end with once you’ve already mastered the other techniques outlined above. That said, we believe drip email marketing is a valuable tool in your arsenal so we will be doing a deep dive into setting up and managing those campaigns in our upcoming lesson on automation. Stay tuned.